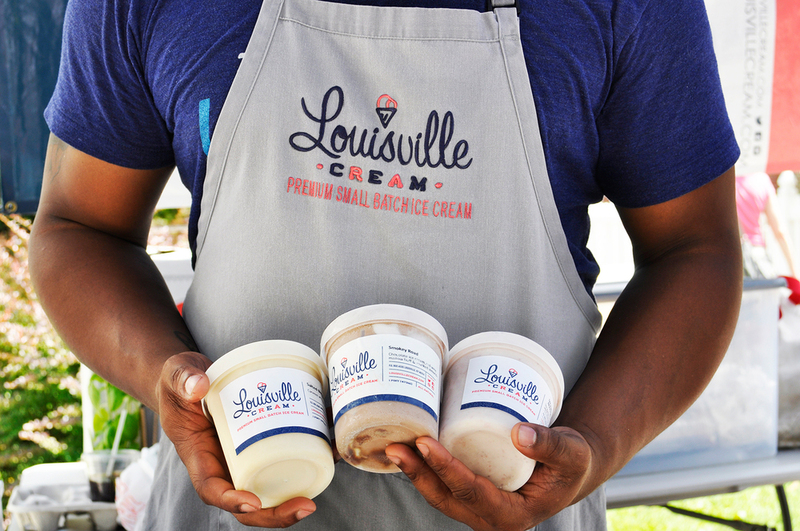 The premium small-batch ice cream maker Louisville Cream has announced plans to open a retail store in NuLu, at 632 E. Market St., in the long-empty space next door to Muth’s Candies. If all goes well with building renovations and other details, owner Darryl Goodner hope to be serving by Derbytime. Louisville Cream, which uses local ingredients whenever possible, has been operating for three years now in a space in Old Louisville, making up to 70 gallons a week of flavors such as Royal Chocolate, Smoked Vanilla Bean and Salted Butter Caramel, as well as more unusual combinations, such as Camp Marshmallow (candied rice cereal with marshmallows), “Brown Sugar Brie” and “Hot Fuzz” (roasted peaches with charred jalapenos). According to a story in the Courier-Journal, Goodner quit his Rubbertown factory job to make rich ice creams, experimenting with unexpected combinations of flavors, such as goat cheese, honey and cherry jam together in something he calls The Red Queen or goat cheese ice cream infused with roasted garlic scapes and balsamic fig jam that won first place at last summer’s Slow Food Bluegrass Garlic Harvest Festival. Goodner began selling his ice creams at Flea Off Market and at food truck gatherings, but he now packages pints which are carried by outlets such as Old Town Liquors and Rainbow Blossom. At his proposed new store, he will sell by the scoop and build sundaes, and will also offer a small selection of pies. He plans to offer 12 flavors daily, a combination of favorites and rotating special flavors, and up to three kinds of pie a day.